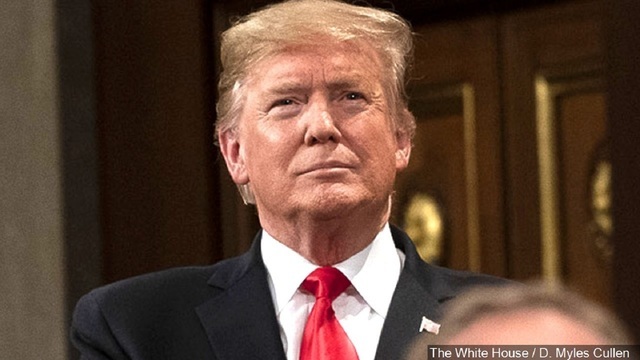 Trump says he's ready to veto national emergency vote "if necessary"
President Trump says he's ready to veto legislation that aims to reverse his national emergency declaration, tweeting early Thursday that he was prepared to veto the vote "if necessary." (CBS) - President Trump says he's ready to veto legislation that aims to reverse his national emergency declaration, tweeting early Thursday that he was prepared to veto the vote "if necessary." "A big National Emergency vote today by The United States Senate on Border Security & the Wall (which is already under major construction). I am prepared to veto, if necessary. The Southern Border is a National Security and Humanitarian Nightmare, but it can be easily fixed!" Mr. Trump wrote. The president issued his emergency declaration as a way to free up funding to build his long-promised wall along the southern border after Congress refused to provide the $5 billion he originally requested. New budget requests now put that total dollar amount at over $8 billion. Senate Majority Leader Mitch McConnell announced that a vote on the resolution disapproving of the president's declaration would take place sometime Thursday. Mr. Trump previously vowed to veto the resolution "100 percent." Four Republicans — Sen. Rand Paul of Kentucky, Sen. Lisa Murkowski of Alaska, Sen. Susan Collins of Maine and Sen. Thom Tillis of North Carolina — have already announced they will vote with Democrats to disapprove the president's emergency declaration over the border wall, enough for a simple majority. More Republicans could potentially defect. During a White House event on drug trafficking Wednesday, Mr. Trump argued that the Senate vote is not about the constitutionality of his emergency declaration. "This is a vote on border security, and it's a vote on drugs and trafficking and all of that. So -- and I think most Republican senators fully understand that." But CBS News' Chief White House Correspondent Major Garrett reports that the White House position to Republican senators is this: vote the way you want, but understand the risks of bucking Mr. Trump on his signature issue. Over the past week, the White House has listened to various Senate GOP options about the emergency declaration, but according to Garrett, is not interested and the president will not sign any clarifying legislation about the future use of an emergency declaration – something pushed by Sens. Mike Lee of Utah and Tillis. The current White House estimate on GOP defections is 6-12. But the White House is not lobbying aggressively or negotiating anything about the motion.